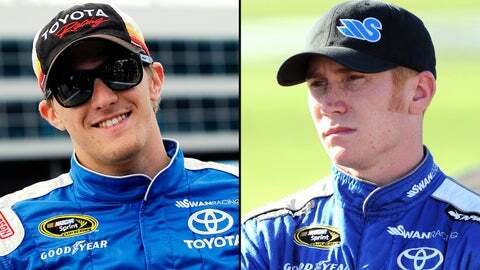 Parker Kligerman and Cole Whitt will drive for the newly expanded Swan Racing for the 2014 NASCAR Sprint Cup Series season. Swan Racing didn’t make much of an impact in the NASCAR Sprint Cup Series in 2013, with the team’s No. 30 Toyota Camry finishing a lowly 33rd in owner points. But that is not slowing down ambitious expansion plans for the squad, which on Tuesday announced that it will campaign two full-time Sprint Cup teams in 2014, with Parker Kligerman and Cole Whitt driving. Swan Racing is owned by oil and gas executive Brandon Davis and his minority partner, former NFL linebacker Bill Romanowski. Whitt has 14 career Cup starts with a career best finish of 25th at Phoenix International Raceway in 2011, while Kligerman has just two Cup races under his belt, with an 18th at Texas Motor Speedway earlier this year the better of his results. Whitt, Kligerman, Kevin Swindell, David Stremme and Michael Waltrip all drove for Swan Racing in 2013, with Waltrip racing in the Daytona 500 with a special paint scheme dedicated to the victims of the shootings at Sandy Hook Elementary School in Newtown, Conn. In making the expansion announcement on Tuesday, Swan made no mention of crew chiefs, car numbers or sponsors for either of the two team cars. "When we launched Swan Racing we pledged to race hard every lap of every race. That’s what we have done and what we will continue to do. We learned a lot this year and now is the time to plan for the long term future by adding more resources to be more competitive," said Davis in a statement issued by the team, which is relocating to a new shop in Statesville, N.C.
"The team is expecting steady improvement and we are in good position to deliver," said Kligerman. "Personally, I am looking forward to working with Cole as a teammate and as a competitor for Rookie of the Year honors." Very excited about 2014, Thank you @SwanRacingCo for the amazing opportunity! @pkligrerman gonna be fun! "I am really impressed by how everything is coming together for Swan Racing. This is the place to be and we are going to truly take the next step in 2014," said Whitt. "Parker and I will learn a lot from each other next year while racing hard every lap of every race. I’m ready to get started." "This is an important moment for this young team," said Swan Racing general manger, Bray Pemberton. "Things are falling into place and we are really looking forward to 2014. In the coming weeks we will make decisions on a number of additional details such as car numbers, hiring a crew chief and the addition of new sponsors," he said.